It was a funny catalyst that made me try my first mushroom. As a child and young boy I never desired to try any mushrooms at all. 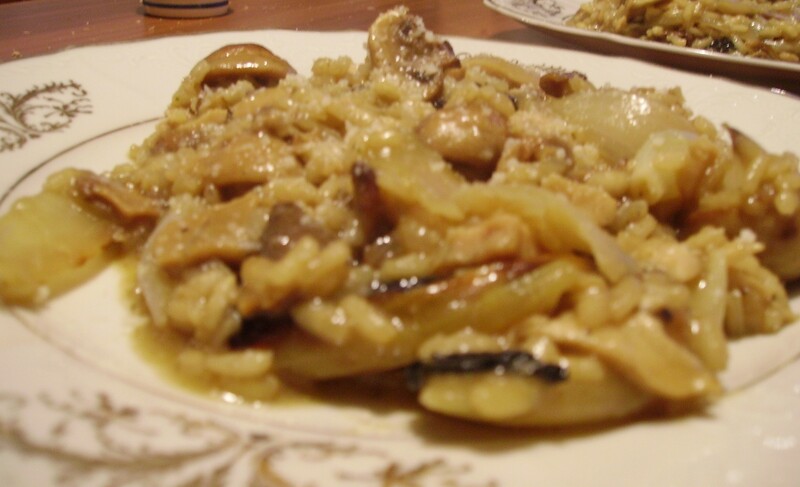 Especially the wild mushrooms that my grandfather would pick along the road and saute back home. Not appetizing to me at all. Funny how silly things can change our mind. There they were on the screen, mushrooms being dug up for survival of the shipped wreck survivors, and there they were in my grandparents kitchen. Freshly sautéed out of a pan and resting in a plate on the counter. In the movie the more mushrooms you ate the faster you would turn into a giant fungus. What would happen to me if I ate one of those mushrooms on the counter? The people seemed to really enjoy them on-screen despite the side effects. I picked one up, took just a nibble, and decided the flavor outweighed the chances of me turning into mushroom monster, so I ate the whole plate. Take your shallots, garlic, button mushrooms, and onion and place them in a pan with 1/4 stick of butter and your olive oil. Add a pinch of salt and pepper and saute for 2 minutes. Add these items to a sheet pan or shallow baking dish to your oven set at 200 degrees celsius, close to the upper grill element and roast for 10-15 minutes. While these items are roasting add the rest of the butter to the pan you were using to saute the above items and melt. Add your rice and stir continuously for 2 minutes. Next add 2 cups of water, your 2 bouillon cubes, and the wild mushrooms. Stir every few minutes and watch for the next addition of water. Take your vegetables out of the oven. Crush and separate your garlic, slice the shallots and onions up, and place everything in the pan with the rice when you add your second 2 cups of water along with the chicken. Stir until all items are incorporated. 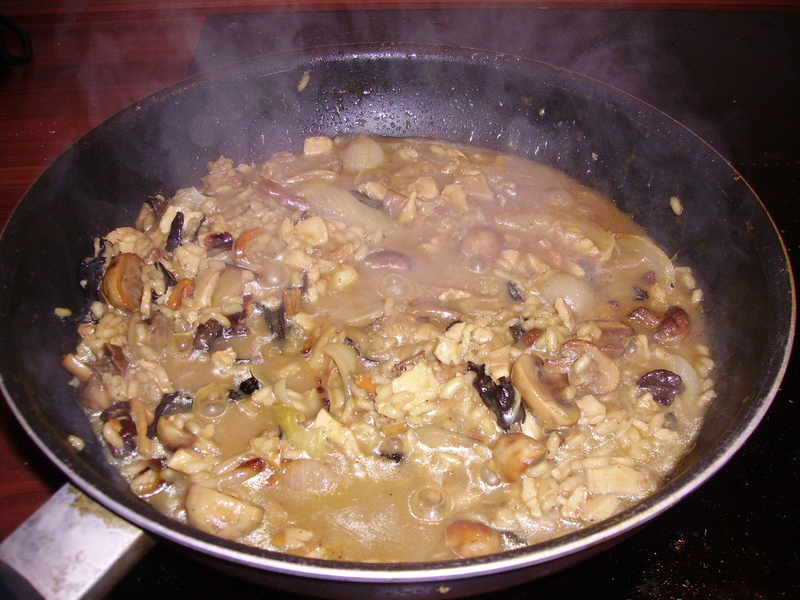 Cook rice until tender which may require an addition of 1 -2 cups more of water. You want the liquid to be soaked up but not completely dry. This is a moist rice dish. When done plate your Risotto dish and sprinkle with fresh grated romano cheese. 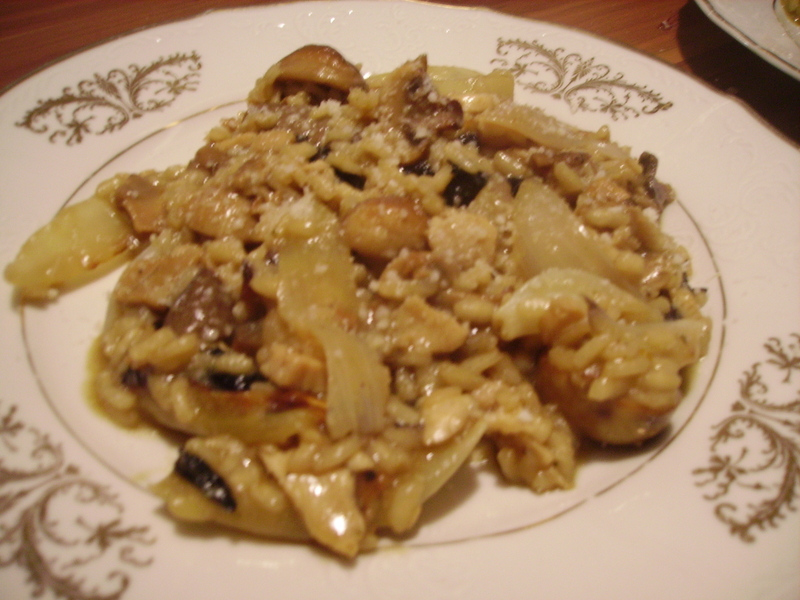 This entry was posted in Boletus, Button Mushrooms, Cheese, Chicken, Dinner, Food, Garlic, Herbs & Spices, Meat, Olive Oil, Onions, Pepper, Recipes, Rice, Risotto, Roasted Garlic, Romano Cheese, Salt, Shallots, Wild Mushrooms, Yellow Onions. Bookmark the permalink.